What external event that week somewhat overshadowed the 2008 CSCMP conference in Denver? I am fresh back from Orlando and CSCMP's 2016 annual conference. It was a good week, and I spoke with more SCDigest readers than at any conference ever. All told I give the event good marks - but as usual I have a few suggestions to make it even better during the course of this column. As a side note, I reported in my 2015 review that I was on the 2016 conference committee, and that led to many people offering suggestions to me on how that event could be improved. All told a good two and a half days in Orlando, time which I will say simply flew by as fast as it has at any conference I can remember. Alas, schedule conflicts prevented me from attending the first two in-person meetings, and at that point I could never really get back in sync. I am not sure, as it turns out, it was the right spot for me anyway, as the function of the committee is primarily grinding out the details of the tracks and track chairs and reviewing the proposals for presentations that have been submitted. Think I could best help on bigger picture issues. But my modest exposure to this process reaffirmed my perception that it really comes down to the track chairs. They wield a lot of power - and the quality of the presentations largely is the result of how well each one does the job. Moving on, thousands of you have watched my daily video recaps of the conference. You will find them here: CSCMP Day 1 Video Review, Day 2, and Day 3. Once again, there were about 3000 attendees, but the crowd felt slightly larger than last year in San Diego. The history of this interesting: attendance peaked in the late 1990s, I believe surpassing 6000 at some point. But then the 9-11 attacks happened, taking the crowd sharply back down, as it did to many other events. Attendance has been stuck somewhere in that just under 3000 range for some time. Can it ever be taken back higher again? 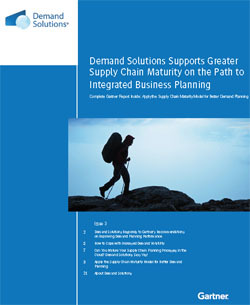 That is a key organizational question for CSCMP. I believe so, but it will take hard and smart work. 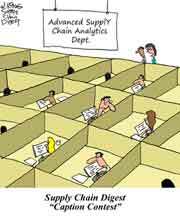 As comparisons, I heard the APICS conference had about 1800 attendees last week, the Gartner Supply Chain Executive Conference has been getting about 1500 of late, and the Institute for Supply Management conference gets a perhaps surprising 2500 or so. From a big picture perspective, for the second straight year there were 16 breakout session tracks this year, down from 20 in 2014, 26 in 2013 and in the 30s not too many years ago. Clearly in years past there were far too many tracks to sort through and not enough coordination across the track in terms of subject matter. So I fully support the overall move to consolidate the number of tracks, though I believe the pendulum may have swung a little too far. I wanted a few more choices in many of the time slots, in part because four of the 16 tracks are "sponsored" in one form or another. Still, there were 96 total education sessions over the first two days, a substantial number by any means. There were again just three 75 minutes breakout session slots (16 presentations in each slot) in each of the first two days, as has been the case for the past three years. That's down from four shorter daily breakouts in 2013. As I have said for the past few years, I think 75 minute sessions are too long, and I would like to see four session slots per day. One way this could be accomplished without adding bloat is to repeat sessions expected to be popular at another time. I will note, however, that one side benefit of the fewer tracks is that attendance at most sessions is better versus the paltry crowds some sessions saw when there were 20+ tracks: Same number of attendees roughly as in the past, divided by fewer tracks and presentations in each times slot. On the final day, Wednesday, the crowd pulls back to maybe one-third of the first two days. In Orlando, there once again were three 90-minute "mega-sessions" to choose from to start the morning (the one I attended on supply chain innovation was pretty good), followed by 90 minutes or so of closing festivities, including as always a motivational speaker. The trend towards panel discussions rather than one or two speakers presenting a topic continues on. Panel quality of course varies a lot, and my own personal view is that panels can be very interesting, but that you don't come away with as many insights and bright ideas as you do in more case study or "thought leadership" type sessions. I would be interested in your take on this question. But I also understand the dynamic that companies can often receive permission to offer comments on a panel more easily than they can to do a full case study presentation. I will tell you though that I look first for non-panel sessions to attend before resorting to another panel one. However, in fairness I will note I did go to one very good panel on the Warehouse of the Future on Tuesday. Next week, I will summarize the breakout session presentations I saw, which out of six included two excellence ones, three pretty good ones, and one not so much. Once again this year, on Sunday before my arriving there was a group exercise of some 200 attendees packing meals for the poor across the globe. Again some 45,000 meals were produced, an operation funded by Monsanto (alas, soon to be Bayer) and CH Robinson. This "Stop Hunger Now" program could be a good one for your company or local organization. I am looking into this myself. In his opening comments Monday, CSCMP CEO Rick Blasgen emphasized CSCMP's role of connecting, developing and educating members, a sort of tag line that I believe is pretty new. What CSCMP needs to do now is make clear the lines between those promised benefits and its programs, and especially to communicate about those offerings and services more consistently. Outgoing board chain Kevin Smith, former head of supply chain at CVS, encouraged greater participation in the CSCMP round tables, and argued companies are often too insular in their approach to innovation. 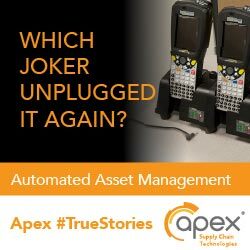 "Someone out there has likely already solved the challenge you are facing," he said, noting that you can use CSCMP as a vehicle to find that insight from others. The opening day keynoter was Captain Scott Kelly, who has flown the space shuttle and made two visits to the international space station, including a recently completed tour that lasted almost a year. Kelly clearly has the "right stuff," and though he really didn't have anything to say about supply chain, he was highly entertaining. Worth noting were his comments on the criticality of teamwork for success in space, and by implication an approach those of us in supply chain roles should take to greater heart. In Tuesday's general session, Blasgen and board member Brian Hancock, now at Kansas City Southern (and who had this idea), formally inducted the first class into the Supply Chain Hall of Fame. Those honored were Henry Ford (the assembly line), JB Hunt (legendary trucker and key driver of the intermodal concept) and Malcom McLean (inventor of the ocean shipping container). From here out there will be a whole process for nominating and voting. Blasgen said there have been some entities that have expressed interest in hosting a physical hall of fame for the members. Tuesday's keynoter was Seth Bodnar, military veteran and young chief digital officer at GE transportation. It was all told a bit too much about GE's market offerings, but I was surprised to learn GE has a corporate goal of being a top 10 global software company by 2020. To that end, it has released "Predix," an operating platform that as best I can gather allows tools for connecting digital data streams, such as from Internet of Things devices and sensors. I did like Bodnar's description of maintaining a "digital twin" of a physical piece of equipment throughout its lifecycle, and his comments that omnichannel, digitization and other trends are forcing companies into critical battles they are not well organized to fight, to their peril. So, all told a good two and a half days in Orlando, time which I will say simply flew by as fast as it has at any conference I can remember. CSCMP needs my two cents like a whole in the head, but in limited space here I will just repeat my call for more true supply chain thought leadership and "heavy hitters" in the supply chain in the general sessions (which we saw a bit in 2015). Along those same lines, the general sessions spend too much time promoting CSCMP (we're already here, right? ), and not enough time showing the audience the supply chain future. But I will happily be back for CSCMP 2017 next September in Atlanta. Breakout session summaries next week. Did you go to CSCMP 2016? If not, why not? If yes, what are your thoughts? Do you like the heavy emphasis on panels? Let us know your thoughts at the Feedback section below. We received several short but interesting emails from David Schneider's guest First Thoughts column on "In Supply Chain It Pays to Put it in Writing," which you will find below. Q: What external event that week somewhat overshadowed the 2008 CSCMP conference in Denver? A: The stock market crash that became the most visible symbol of the start of the Great Recession. On Sept. 29, the Dow Jones Industrial Average fell 777.68 points in intra-day trading, and fell substantially other days of the conference as well.